Brittany Collins Hampston knows first hand what it is to be a first-generation college student. With what she calls a fabulously humble beginning, Mrs. Hampston comes from a broken home of divorced parents who both started college but never finished. Even though her parents didn’t finish, they strongly valued education and were determined to not let her go down the same path. Throughout her high school career, Mrs. Hampston began to shape the bright future that stood before her. She was a star athlete, which earned her numerous basketball accolades, she was heavily involved in a variety of school activities and was an active volunteer in her community. She kept an active schedule and still managed to graduate 10th in her high school class. Brittany was determined not to stop there and put her ambition and faith to the test during her senior year. While her family worked hard to support her, Brittany knew they would not be able to financially afford her college education. She applied to only two colleges and got into the great University of Cincinnati, where she received an academic scholarship from the Darwin T. Turner Scholars program to finance her education for the next four years. 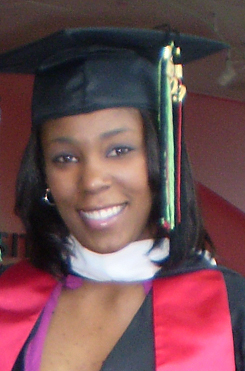 Her hard work, dedication and perseverance drove her to become the first in her family to not only graduate with a bachelor’s degree, but also a master’s, both from the University of Cincinnati. She decided to continue her education and is currently blazing the trail to become the first person in her family to receive a PhD. In her first self-published book From First Generation College Student to First Generation Graduate, Mrs. Hampston draws on her experiences by offering practical tips and insights for students considering higher education. From start to finish, the book reads as if Brittany is having a face-to-face conversation with the reader and offers up solid advice that many first-generation college students lack heading into their first few years of college. ***For all purchasing and booking information, please email Gen1Grad@gmail.com.